Sometimes, History can throw us a curve ball that defies logic, reason and our understanding of the universe. 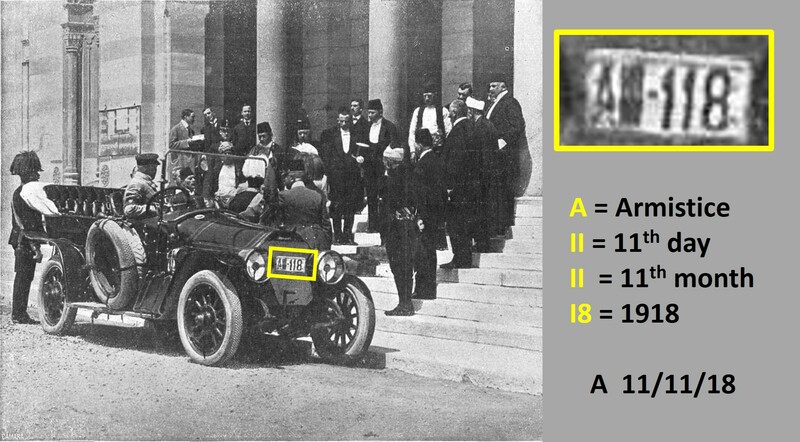 On Sunday June 28 1914 Archduke Franz Ferdinand, heir presumptive to the Austro-Hungarian throne was celebrating his fourteenth wedding anniversary with his wife Sophie in Sarajevo. As the couple travelled through the city in a motorcade, their driver made a wrong turn into a street where a Bosnian Serb called Gavrilo Princip was loitering with a loaded pistol. He grabbed his unexpected opportunity and killed them both. One wrong turn by an absent minded chauffeur ignited the spark that plunged fifty nations and over seventy million soldiers into the First World War. But in a curious twist of fate, the number plate of the car in which the couple were travelling when met their grisly fate may have actually predicted the date on which hostilities were brought to an end. An uncanny reference, some have suggested, to the Armistice signed on the eleventh day of the eleventh month in 1918. The Archduke was not a particularly popular figure. But Austro-Hungary used the assassination as the excuse it wanted to declare war on Serbia. In 1914 most European countries were bound together with many different international treaties, and these so-called “entangled alliances” pulled the rest of the world into the conflict. Two opposing alliances emerged. Joining Austro-Hungary were the countries that made up what became known as the Central Powers; the German Empire, the Ottoman Empire, Bulgaria and later Finland. Countries supporting Serbian interests included the British Empire (including Canada and Australia), the Russian Empire, the French Republic, Italy, Japan and the United States. They became known as the Allied Powers. Over the next four years over sixteen million people died. Sometimes, it is hard to reconcile our monochrome pictures of the First World War, of desolate battle fields and bombed out buildings with the reality that many people continued to buy and sell goods and services. Coins were still struck, circulated and used for daily transactions. Today, each surviving coin is a witness to history, and of a world that has changed almost beyond our comprehension. 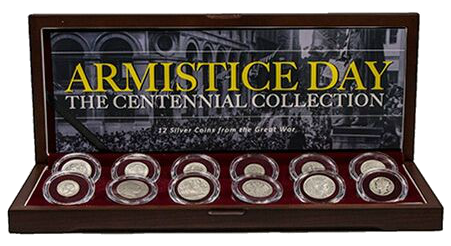 The London Mint Office is very proud to present a historic collection of silver circulating coins that would have been found in the pockets and purses of our ancestors on the eleventh day of the eleventh month of 1918 when the Armistice was signed. 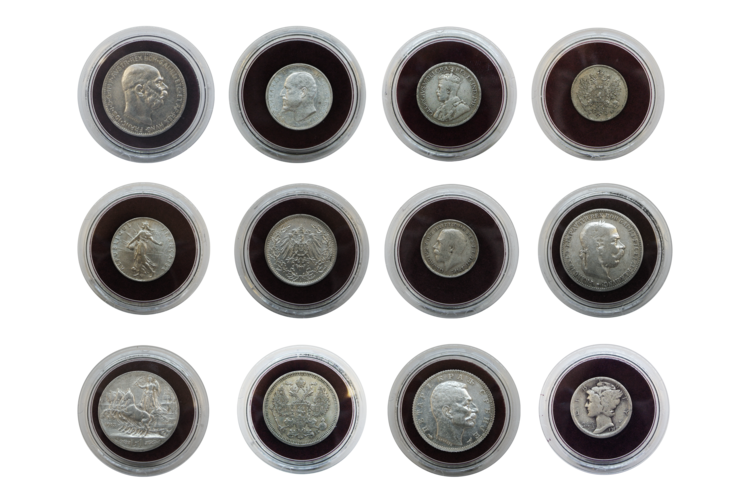 The twelve-coin set features seven original coins struck by the Allied Powers (Great Britain, Canada, France, Italy, Russia, Serbia and the USA), and five coins struck by the Central Powers (Austria, Bulgaria, Hungary, Germany and Finland). As former circulating coins, each carries the unique marks of their specific history with them. Once, they served an important function in the commerce of their countries. Today, they serve as important historical artefacts that remind us of the time our world changed forever. 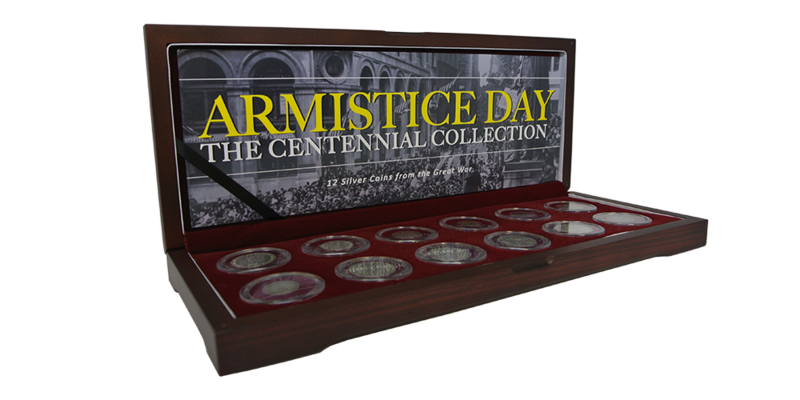 Each coin has been encapsulated to preserve it for future generations and displayed together in a deluxe presentation case.